I'm obssessed with brows, mostly due to the lack of it. Unfortunately, I share a problem faced by many asians: thin and sparse eyebrows. I remeber starting to shape and fill my them since highschool in hope of creating perfect brows to frame my face. Now, 15 years later, I am rather pleased with my skills and technique, but there's always room for improvement right? In my opinion, Korean actress Song Hye Kyo has the perfect shape, arch and fullness. I have always prefered a fuller brow as it gives illusion of youth and natural beauty. How did she get the "good" genes??? 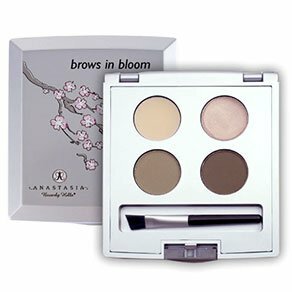 So out I go and bought Anastasia's Brows in Bloom, a mini quad palette with two shades of brow powder, a wax cream, a highlighter cream and a small brush. It's compact and includes everything you want and need. Two shades were available: brunette (mine) or blond.